'PSHRS' system is designed to accommodate all required instruments, test equipment, control & protection system, alarm and indications. All Meters are integrated in the Test Panel and the online data transfer from these meters is done through the PC based software. The testing instruments & equipments included in the offer are of reputed make. All the equipment used shall be of very high quality and most dependable and designed with proper safety margin to carry the necessary electrical parameters like current, voltage and power for continuous use throughout year and proper protection to trip under any abnormality. The test system is likely to be used round the clock. All the measuring instruments, ratio bridges, resistance bridges will be latest calibrated and the calibration certificates will be provided along with the supplies. All the major equipment will also carry test reports as per the standards. In 'PSHRS' system, data acquisition from various test instruments happens without any human intervention. 'PSHRS' system is devised for testing of transformers, CT/PT, Circuit Breaker, LA, Isolator & Earthing System etc. It acquiring on-line data from test instruments, and printing reports that are compliant with all national and international standards such as IS-2026, IEC-60076, ANSI-C57 and IS11171. Software has the user interface that acquires on-line data from test instruments to generate test reports with auto indexing and page numbering. It consists of an option of manual data entry too. The software can be used in the automatic mode for acquiring data from test instruments with the click of a mouse or data from a test instrument can be read and entered in the software manually. Software has facility to provide for multiple, user defined permutations and combinations based on the type of a transformer, type of phase, type of winding, type of cooling, various rated capacities, various vector connections and tap changers. Software is working on MS SQL environment. It has facility to generate the MIS reports by selecting a specific period, Distribution Division, KVA, impedance and the inspection type. Software has easy storage, data retrieval; data analysis capability ensures error-free complex calculations facility. Software generates auto indexing and page numbering of test reports according to the selected test sequence. It must have the facility of printing test reports on A4 size blank sheets or on letter-heads. Along with the detailed report format, software has the short report facility which gives the report of the routine test. The short report format is used to reduce the number of pages for test reports. Software has the database backup facility to take the backup of database in the hard drive. Software has facility to export data in other formats such as MS excel for further analysis. Software has the facility of printing formulae sheet on demand. Safety Management through Safety of Sub-station and Personnel. Management Information & Decision Support System. Reduction in Maintenance Breakdown & Its Cost. Increased Average Equipment Life leads Delay in Capital Investment. Manpower Optimization or Easiness to Divert Manpower to other Work. Safety is increased because deficiencies are noted and corrected before they present a hazard. Equipment efficiency is increased because conditions that ultimately increase the transformerâ€™s losses can be corrected. As the power requirements of a facility grow, any overloading of unbalanced circuits will be detected more quickly, allowing for adjustments to be made before any damage is incurred. If impending failures are discovered, the repair work can be scheduled during off-peak hours, reducing the amount of inconvenience and expenses. More numbers of tests are carried out in minimum outages with minimum manpower. Life of equipment is increased hence capital investments are delayed. 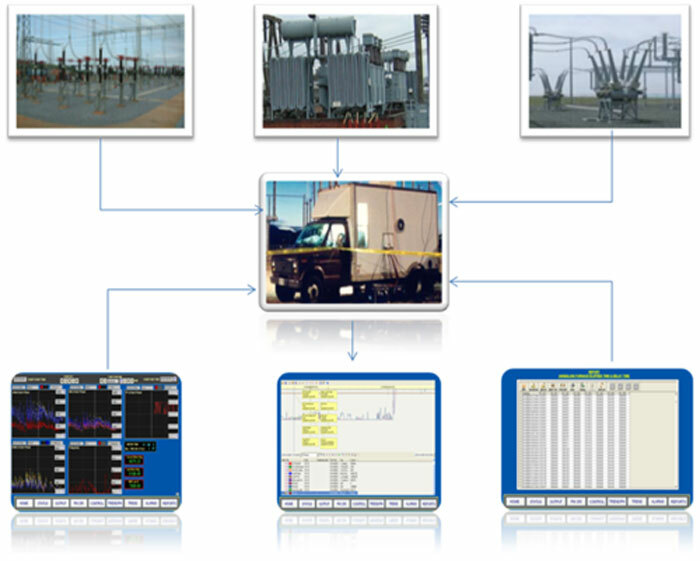 Retrieves relevant data for enhancing maintenance, operation function & predictability at various Sub-stations. Increases the functionality, reliability and safety of Distribution Networks. The system will conduct following different test for various equipments as under. 5 Capacitance and Tan Delta of Terminal Bushings & Windings. 2 Measurement of Leakage Current. 1 Measurement of Unit Capacitance and Bank Capacitance.